This remarkable painting is of the highest standard in all respects: painted by Susan Crawford, one of the world’s foremost equestrian artists, its subject is among the most prolific racehorses of the last decade. 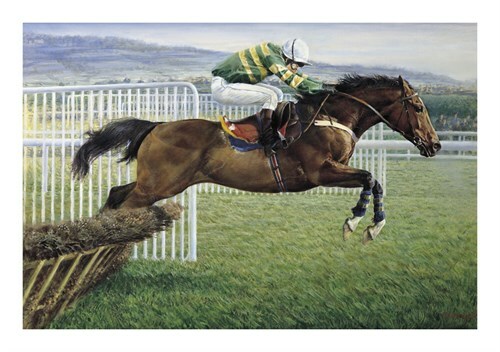 Istabraq’s feats at Cheltenham will live long in the memory of racing enthusiasts, and his status as one of the finest hurdlers of modern times is done full justice in this striking print.Foaled in 1992 at Sadler’s Wells, Istabraq was sired by Northern Dancer, the most successful sire of the twentieth century. After initially failing to impress his owner, Sheikh Hamdan bin Rashid Al Maktoum, Istabraq was sold to John Durkan, who immediately tipped the horse for success at Cheltenham. Istabraq’s first major win, the 1998 Irish Champion Hurdle, was an emotional occasion, with Durkan having died shortly before the race.Durkan would have been proud of Istabraq’s spectacular fulfilment of his potential. After storming to a twelve-length win in the 1998 Champion Hurdle at Cheltenham, he repeated the success in the two following years to become only the fifth horse in history to record a third successive win in the race. In 2001, Istabraq was again the clear favourite for Cheltenham, and was on course to achieve an unprecedented fourth victory; yet he was cruelly denied the opportunity, as the festival was abandoned due to the outbreak of foot-and-mouth disease. This had little effect on his place in the affections of the race-going public: after withdrawing through injury in his final appearance at Cheltenham, Istabraq was afforded a standing ovation by an admiring crowd, marking the departure of one of the greatest stars to grace Britain’s most prestigious race meeting.